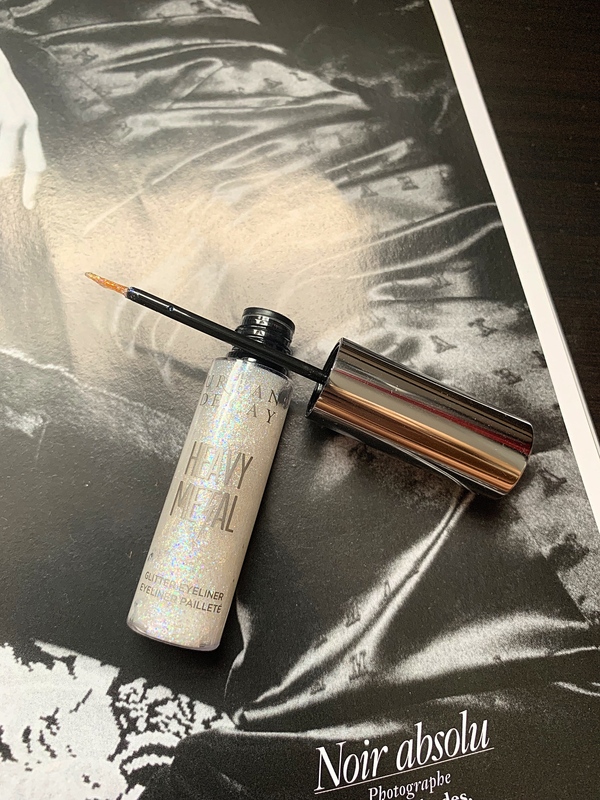 I hope you are all doing well, it’s only Wednesday and I am already dead tired nonetheless, today, I am sharing with you my review on Urban Decay’s heavy metal glitter liners. 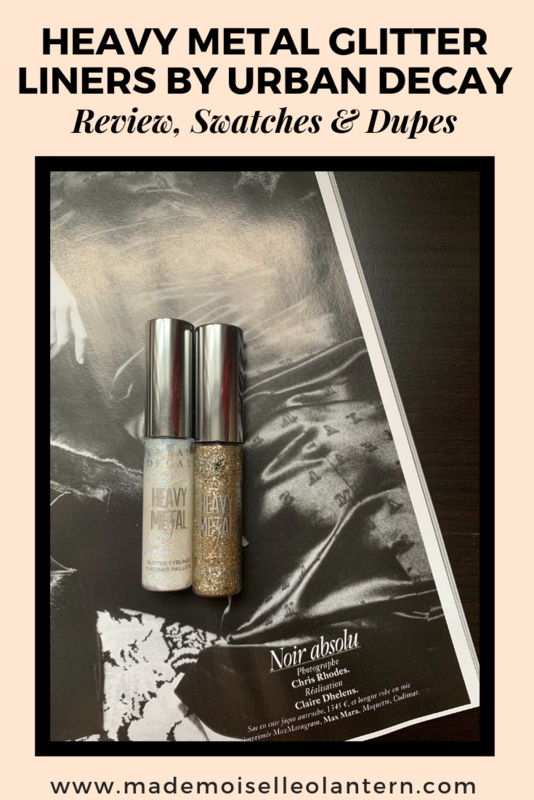 This is not a new product but I still thought it would be interesting to write a review on it since there are not a lot of good glitter liners in the market and these are pretty pricey! Also, I apologize that I am posting this at 10am and not 9am, I overslept, sleeping late is not for me because I like to wake up early to work on my blog but the thing is, my boyfriend sleeps really late which does not encourage me to sleep early :p but well! These glitter eyeliners come in 12 different shades, retail for 20$ and contain 7ml of product which I think is very good for a liquid eyeliner. 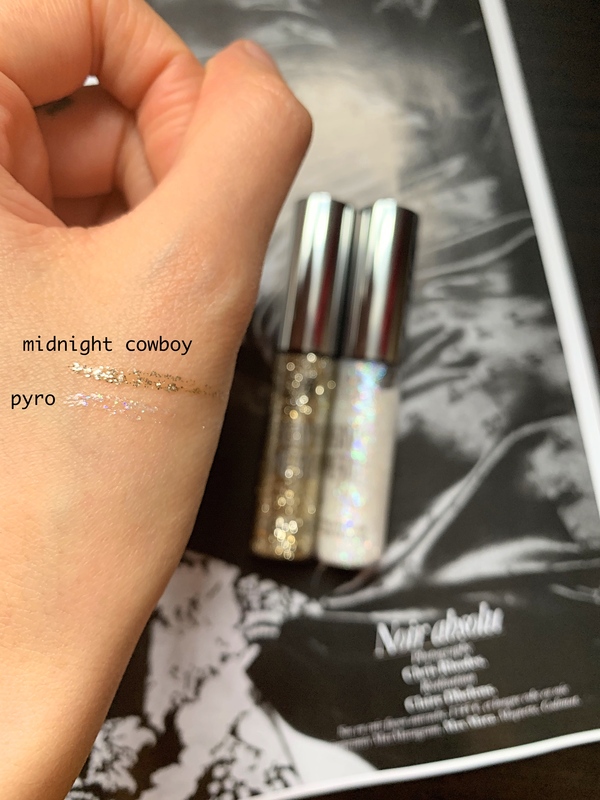 I have the shades “Midnight Cowboy” a gorgeous beige and “Pyro” an iridescent silver shade. 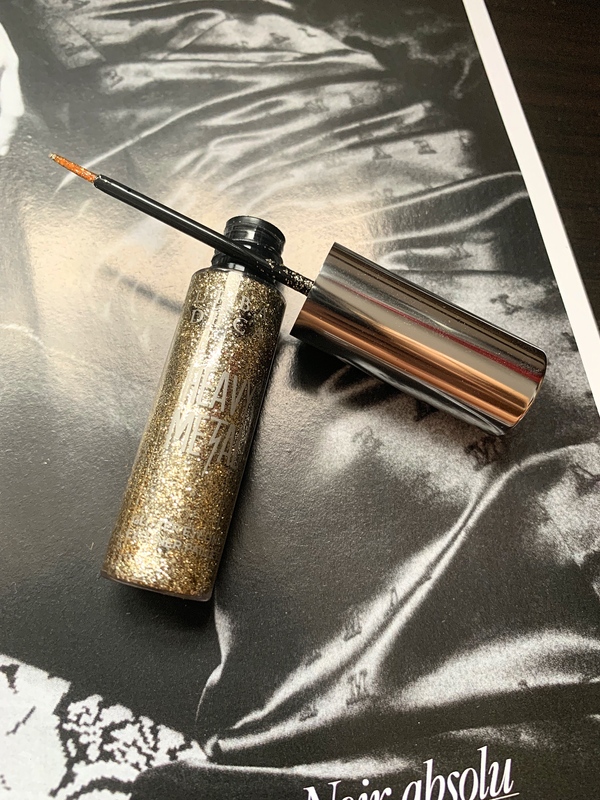 These glitter liners are described as “buildable, water-based liner that contains superfine glitter in a clear base” a.
I really love how these glitter liners look, the packaging is so sleek and rock n roll, mainly because of the font of “Heavy Metal” but also the fact that the tube is see-through and the applicator has a silver cap. 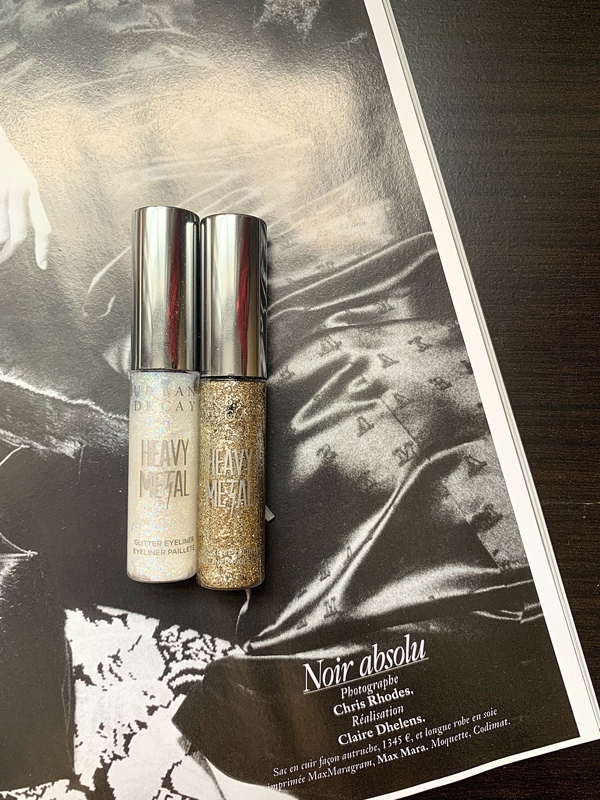 But in general, the packaging is pretty simple, I guess it looks pretty because you see the glitter and that’s really pretty. I do love the applicator cause it is so precise and makes it easier to work with. I love how these glitter liners perform, they have a clear base so they are pigmented but they won’t show a lot if worn alone. I do love wearing them on top of an eyeshadow cause they make the eyeshadow pop but they are also very flattering alone, I once applied them below my wing line, it was very pretty. On top of being pigmented, they dry pretty fast I would say but they don’t crack, they are buildable and they don’t smudge. Moreover, they are very long lasting, I went to a party wearing “Midnight Cowboy” and damn after 12 hours, it was still their, intact. I honestly don’t know many brands that offer glitter liners and these by Urban Decay seem to be the best rated. Next Post 10 Makeup Brands I Want To Try in 2019! I like these a lot. I have Midnight Cowboy. I usually put it on my lower lash line to add a little sparkle. These are not my style but look pretty for sure . THanks for the detailed review. I’ve always been curious about these. I know I wouldn’t get much use out of glitter liners but for some reason I am still drawn to them, haha. These look really pretty and I’m glad you enjoy them. Great review! I’ve never tried these, but I love their 24/7 eye liner pencils for everyday. I’ll have to check these out in person next time I’m at Sephora or Ulta. I think they would be so fun to try out! I’m not a glitter eye makeup person normally but these are really pretty!! Oh, I’m glad to know that the NYX is just as good! Sometimes you just have to think about price instead of a name, you know? Plus, I love NYX! I love these liners too and own both of these shades. My favourite part is how precise the applicator is! It makes it so easy to do that glitter line in the crease that is popular these days, and of course easy to get into the inner corner! They look great all over the lid too 🙂 Lovely review! Thank you!! yes I also love how precise the applicator is, makes applying so much easier and I love applying on my crease when I do a cut crease, it’s so nice!! These have been on my wishlist for ever! then you should definitely try them out, they are a bit pricey but I think they are worth it! I am happy I purchased them tbh!!! I’m planning to this year!